The thrill of betting on US sports, playing poker online, or having a few spins of the slots is hard to beat. In 2019, Americans can bet online at a wide range of stakes and on a huge range of games. For the most part, the gaming is fun and friendly. US players take their winnings and get on with their lives. For others, however, gambling on the net in the USA can develop into something a little more serious. For a minority of gamblers, addiction can develop. In the most serious cases, bankruptcy, family break-ups and depression can occur. If you find that you can't live without gambling in your life, you are constantly borrowing US dollars to play games, or even that you love the thrill of losing as well as winning, you may have a gaming problem. Other signs you have a gambling addiction are committing crimes in order to fund your gaming habits, gambling when bored or when lonely to get a quick thrill, becoming short-tempered with those around you and getting into more arguments, and losing track of the time you are spending at your computer betting on games. 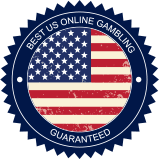 All responsible USA betting sites will let you self-exclude. That means you can voluntarily remove yourself entirely from the room and stop yourself from playing there. With self-exclusion, you won’t be able to log in and play for real money at US betting sites. Less drastic action can be to ask the site to impose gambling limits on your play. With that in place, you will be restricted from depositing or betting over a certain limit in a chosen timeframe. Self-exclusion is easy to set up at most United States gambling websites. Just contact the specialist customer support team at any good legit US gaming website. They will be able to help out and keep an eye on your spending. In serious cases, you can even fill in a more comprehensive self-exclusion request form with one of the licensed gaming commissions. They will help you exclude yourself from every site and network under their jurisdiction, so you don't have to fill out a form at every USA casino or poker site. It is worth noting that this can be an extreme measure. Voluntary self-exclusion can be permanent and irreversible. But if you have a serious problem, this serious measure may be the best answer. Responsible gambling online in the United States is all about keeping track of your winnings and regular betting, not chasing losses, and only gambling with cash you can afford to lose. If you are finding that you are gaming for the majority of the working day and losing connections with loved ones and friends, missing work, or finding that self-exclusion isn't working, it may be time to get professional help. Luckily, in the United States in 2019, there are several associations that can help. We’ve put together a list of the top gambling addiction support groups, non-profits, and help lines. We recommend reading them further. They offer some great insight into what constitutes a gambling problem and how you can handle various situations.